Statutes of limitations on mesothelioma claims are as short as a year in some states. Protect you legal rights and speak with a mesothelioma lawyer before time runs out. Statutes of limitations are deadlines for filing a claim by state. Statutes of limitations range from 1 to 6 years to file a claim. The statute of limitations may differ depending on the type of claim. Speaking with a mesothelioma lawyer as soon as possible can protect your rights. After a diagnosis or seeing a loved one pass away because of mesothelioma, it’s often difficult to find the motivation to begin looking into your legal options right away. With so many other medical and personal decisions to make, filing a mesothelioma claim may be the last thing on your mind. But it’s important to keep in mind there’s a limited amount of time to act on your legal rights. Statutes of limitations are deadlines set by each state for how long an asbestos victim or surviving family members can file a mesothelioma claim. This means you have a time limit in which to file or risk losing the compensation you are entitled to. The statute of limitations on mesothelioma claims varies dependent on the type of claim filed (personal injury or wrongful death claim) and where the claim is being filed. Most states have an asbestos claim statute of limitations of 2 or 3 years, though a handful of states have longer statutes. Patients and their loved ones should also keep in mind there are some states that only allow one year to file a claim, so it’s important to speak with a mesothelioma attorney early on. Statutes for personal injury claims apply to mesothelioma patients and other asbestos victims filing a claim on their own behalf. With asbestos claims in particular, the courts realized it wasn’t fair to use the same statutes of limitations as other personal injury cases because of the long latency period associated with mesothelioma and other asbestos-related diseases. Many patients aren’t diagnosed until at least 10 years after initial exposure. Thanks to this discovery rule, the mesothelioma lawsuit statute of limitations doesn’t begin until after the proper diagnosis is made. 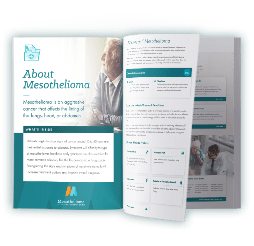 Patients should still keep in mind how much time it takes to build a mesothelioma case, especially if there is uncertainty around how or where asbestos exposure initially occurred. It’s pertinent to seek help from a reputable law firm as soon as possible to ensure you don’t limit your legal options. For surviving family members of a mesothelioma victim who died from the cancer, there is a separate statute of limitations for filing a claim. The timeline to file a wrongful death claim starts after a mesothelioma victim has passed away. The majority of states have a deadline of just two years after your loved one has passed away, with some states allowing three years to file the claim. It can sometimes be difficult for loved ones to file the claim because of their lack of knowledge around how and where the asbestos victim was exposed. This may require more time to gather evidence and records to determine where exposure occurred. Like with personal injury claims, it can take an experienced mesothelioma attorney months to properly build a case, so it’s important to seek legal help as soon as possible. For many mesothelioma patients, it can be difficult to know which state to file their claim with because of the confusing nature of asbestos exposure. Many people don’t even realize they were exposed until they are diagnosed years later, which makes it challenging to pinpoint where and how exposure occurred. An experienced mesothelioma lawyer will be able to help you with the entire claim process, including research to determine where exposure occurred. Your attorney can also determine the appropriate venue in which to file your claim, also keeping in mind the mesothelioma lawsuit statute of limitations. Below are the states’ statute of limitations for both mesothelioma personal injury claims and wrongful death claims. Each state requires the claim to be filed by their given deadline after diagnosis or death, or the claimant may forfeit their right to compensation. Page last modified on August 7, 2018.